Welkom op onze mooie CASA MANU. Het biedt een volledig ingerichte villa waar u zal volledig op hun gemak voelen. 3 Het huis heeft een zeer comfortabele slaapkamers, twee badkamers, een zeer mooie en grote woon- / eetkamer met open haard. De keuken met fornuis / oven, koelkast en een vaatwasser alle keukengerei om een ​​heerlijke maaltijd te bereiden. Buiten heb je een barbecue aanwezig. Geniet van een overdekt terras met eethoek, een mooie buitenruimte rond het zwembad (ca. 8x4m) en een zeer intieme sfeer. De Villa CASA MANU werd gebouwd op een 570 m2 perceel en is gelegen tussen de twee prachtige stranden van Cala Anguila en Cala Mandia die indruk met zijn kristalheldere water, strand en bars en zijn binnen een paar stappen. Er zijn diverse restaurants / cafés en supermarkten op loopafstand Entfernung`. Breng uw vakantie door in een ontspannen, familiale sfeer. De stad Porto Cristo ligt op slechts 3 km afstand met zijn prachtige haven, de beroemde draak grotten en vele bars en restaurants. Wir (4 Erwachsene und ein Kind) waren hier im September zu Gast. Die Villa ist sehr schön und ruhig gelegen und sehr groß. Sie ist sehr geschmackvoll eingerichtet und wurde mit allem ausgestattet. Auch der Außenbereich, Pool und Terrasse, waren sehr gemütlich. Sehr schön hat uns hier die Beschattung durch die Markisen und die Bestuhlung mit den gemütlichen Liegen gefallen. Der Weg zum Strand ist kurz und die Strände sind sauber mit kristallklarem Wasser. Unser bevorzugter Strand ist Cala Anguila. Gut und günstig gegessen haben wir in Porto Cristo (z.B. im Restaurant Cap des Toi) oder in Cala Anguila-Cala Mendia, im Restaurante Las Palmeras. Lecker Brötchen für das Frühstück bekommt man gleich um die Ecke in der Federico Garcia Lorca. Zum Einkaufen sind wir in den Eroski Markt nach Porto Christo gefahren, der ist nur 5 Auto-Minuten entfernt und hier bekommt man so ziemlich alles. Vielen Dank auch für die ausgezeichnete Kommunikation während des Aufenthaltes. Wir möchten auf jeden Fall hier wieder Urlaub machen. jederzeit gerne wieder. Sie waren tolle Gäste und die Konversation hat Spaß gemacht. Beautiful villa in a great location! We have just returned from a week's stay in Casa Manu and had a fantastic holiday. The villa is spacious (there were 4 adults and 2 children in our group) with all the amenities you could need. The pool was lovely and a good size with lots of pool toys that the kids enjoyed. 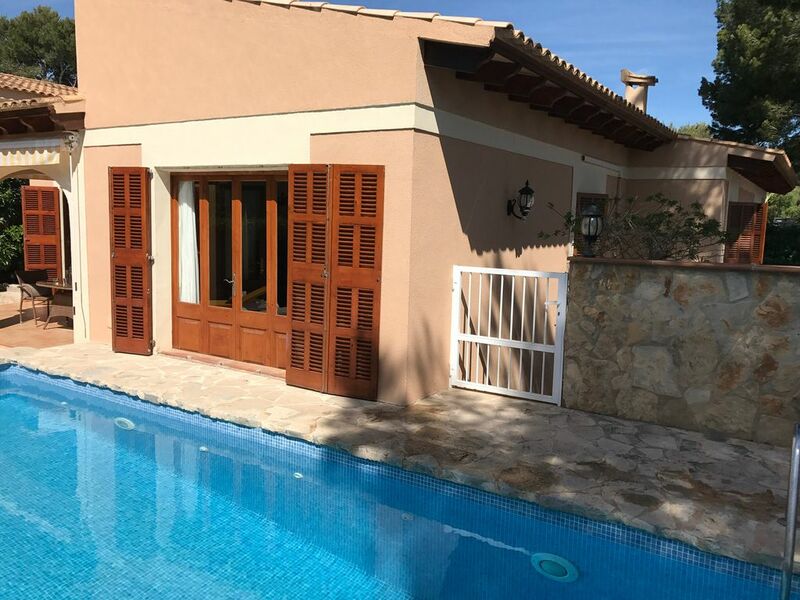 The villa is located about a 5 minute walk from two great beaches (we preferred Cala Anguila) and a short walk to some small shops and cafes. The area is quiet and you can walk to all the things you need (including a great restaurant just a short walk across the road), but we had a car so we could explore Porto Christo (about a 5 minute drive) which has some lovely harbour side restaurants. The owners of the villa could not have done enough for us and their communication was excellent throughout the stay. They answered any queries we had really quickly and were very helpful. The villa was lovely, spacious and very well equipped down the the smallest detail, for example various condiments and even hand soap in the bathrooms. The villa is in a quiet location close to 2 beaches that are an easy walk even with children. The owners were great from the start and ensured everything was just perfect for us. There are plenty of restaurants and a car is really not required but if you want to explore may be worth renting. Having rented properties for holidays during the last 10 years I can say this is the best and certainly contributed to an overall a fantastic holiday experience. I am already planning to return next year. Rested in this house in June-July 2018. We liked everything very much. The house is located between two bays and you can alternately walk to different beaches. ) Just 200 meters from a cozy restaurant. The house is well equipped, has everything you need for cooking. The Internet works at high speed, there is even an apple tv and the kids were very happy watching cartoons in the evenings ). In Russian. Отличный дом, хорошая планировка, кухня оборудованная. Есть все мелочи: приправы, масла, хорошая посуда, игрушки для детей, настольные игры. Рядом два пляжа, до Порто Кристо всего 3 км, ездили туда иногда погулять. Пляжи песчаные, вода потрясающая бирюзового цвета. В общем, дом отличный. We visited as two adults and two children (12 and 14). The villa was very much as described and exceeded our expectations in every way. It was clean, spacious, well laid-out and full of character, both inside and out. The pool and terrace were perfect for a relaxing holiday. We used the barbecue several times and the children spent as much time as they could in the pool. All three bedrooms have comfortable beds and plenty of storage. The kitchen and living areas are well arranged for cooking, dining and relaxing. The location is perfect, only 5 minutes from the beach and in a peaceful neighbourhood. Both beaches, Cala Anguila and Cala Mendia, are fine sand and the sea is a good depth for all ages to enjoy. Snorkelling is highly recommended. In our opinion Cala Anguila has the edge over Cala Mendia. There are beach bars on both and lounger/umbrella facilities if you need them. For shopping there are small convenience stores with a limited range of food and plenty of inflatable beach/pool toys within a couple of minutes walk of the villa. Since we hired a car, which was useful for shopping, exploring and getting to and from the airport, we found the Aldi supermarket in Manacor very useful and good value. We ate out in Porto Cristo a couple of times. The waterfront Fusion Bar had a good value Tapas sharing plate with a relaxed atmosphere. Quince retaurant was also enjoyable and a little more formal. All in all we had a very relaxing time at the villa and would highly recommend it. Dear Thomas and family, thanks for having you. Gladly everytime again you are great guests. We stayed here as a group of 4 adults and two young children (aged 2 and 3) in mid-June. The house was perfect for our needs and exactly as described in the listing; clean, spacious and really well presented inside and out. Everything we needed such as towels, WIFI, TV, beach toys were all provided so we felt very well looked after. The large pool is brilliant and there is also a very nice patio with barbecue and outside dining area. You can walk to the nearest beach which is just 5 minutes away at the bottom of the road. There is also a small playground on the way (with trampoline, soft-play area and snack bar) where kids can let off more steam. All the restaurants and bars we tried in Cala Anguila were excellent and not too pricey. We especially liked Cactus Bar (quite basic) and the Cala Mendia beach restaurant (also quite basic but fresh fish and great location). Porto Cristo is well worth a visit and has a fantastic beach, marina and selection of restaurants. It is just a short taxi ride away that cost about 8 Euros. One reservation is that the local supermarkets in Cala Angulia are quite expensive and don't have much fresh produce. We certainly weren't able to buy any meat or fish for the barbecue. If you are not planning to eat out every night, I would recommend hiring a car so you can explore the area and go to the larger supermarket in Porto Cristo. However, you can get really nice fresh bread from the little shop closest to the house. Overall, we absolutely loved our stay at this villa. Cala Anguila is a beautiful, peaceful resort which is great for families and couples too. We would definitely recommend it to friends. Dear Tom, Family and friends, thank you so much. We are very happy you felt so well. Very glad to have you again. Thanks also for your note concerning going to Porto Cristo to buy fresh and good foods.